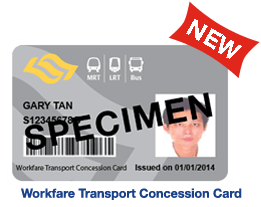 The Singapore government has announced the new Workfare Transport Concession Scheme (WTCS) for the recipients of the Workfare Income Supplement (WIS Scheme). The concession holders of the scheme will be able to enjoy 15% discount off the adult fares on buses and trains. You will recieve the letter from Land Transport Authority (LTA) if you are already on the WIS Scheme. You may apply online via www.transitlink.com.sg or using the hard copy posted to you. The deadline to make the application is 31 December 2014. But do it immediately so that you can get to enjoy the discount off the transport fares. You will be given $30 of interim finanical assistance to help defray the transport cost during the implementation period from 6 April 2014 to 5 July 2014. This assistance amount is available up to 31 December 2014 only. Do I qualify for the WTCS? Individuals who qualify for the WIS Scheme and received a WIS payment from 1 December 2013, will be informed of their eligibility for the WTCS. Do you qualify for the WIS? You may visit the Workfare to find out more whether you qualify for it. Whom it may concern, I want to know when will be eligible for workfare transport concession card ? If you are eligible for the WIS then you should get the workfare transport concession card. You can also check whether you qualify at the Transit Link Office. You can also call 1800-222-6622 on Monday to Friday to find out more. I had claimed my IFA of $30. From the letter stated that I am eligible for the WTCS, can tell me more what is it about and how to apply? Thank you. You will get concession for travelling. You can apply it at Transitlink office with a colour passport-sized photograph taken within the last 3 months and NRIC.